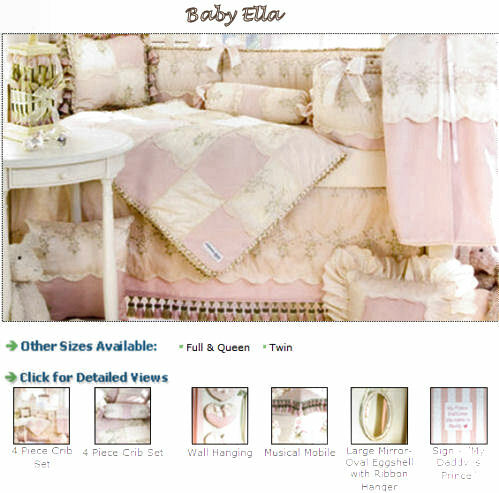 Enjoy the pictures of toile nurseries decorated with lavender, blue or pink toile baby bedding. They are sure to inspire those who thought they knew everything there is to know about French toile fabrics to take a second look. Modern moms with excellent taste and a flair for nursery have come to love decorating with toile nursery bedding in gender neutral nurseries as well as rooms specifically designated for baby boys and girls. Do-it-yourself decorators as well as professionals are well aware that toile is often the best choice for blending the baby’s room decor with that of the rest of the home. Another positive trait of this fabric is that there are so many different patterns that can become the centerpiece for themed nurseries. I have used nursery rhyme toile baby bedding successfully in vintage circus nurseries, French country nurseries as well as rooms decorated in a storybook style. When decorating for a baby girl’s nursery pink toile baby bedding is the obvious choice in the same way that baby blue would be best for boys. Modern toile crib sets for baby girls and boys give mom and dad the choice of traditional white or cream backgrounds but for those who prefer their toile to have a contemporary look, sage green and dark chocolate brown toile print fabrics are making the scene. Parents often reject this classic fabric and dismiss it as being too fussy or too feminine for a baby boy’s nursery. Thankfully, I have been able to convince many of you that nursery rhyme toile baby bedding gives a space a classic look without being too elegant and above all, the colors are very flexible and the complement so many styles of nursery decor. One of my favorite nurseries that I have ever decorated for a baby boy had a chocolate brown and baby blue color scheme with a custom made nursery bedding set made from toile fabric with a hunting scene print. I tried to convince my client to go with a forest green and brown layout but they chose blue. Even so, the nursery turned out beautifully. The new dad (who wanted his son’s room to be masculine) was very pleased as was the mom who had her heart set on a toile nursery. Mint green, yellow toile, lavender or even bright red toile baby bedding sets are stylish choices for the gender neutral nursery. If more color is desired, colorful nursery rhyme toile fabric with its multi-colored storybook characters is capable of creating a foundation for a variety of nursery color schemes that are unisex by design. And, then there is the most popular toile nursery bedding of all, black and white. Without a doubt, black and white toile is THE most flexible of all the colors available. This is a common misconception perhaps due to the fact that in the past toile fabrics were used only in the most elegant rooms of a home. Due to modern manufacturing processes, toile is no more expensive than any other high quality fabric. 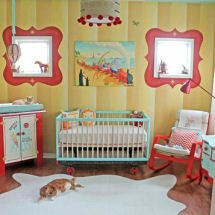 We have many pictures of toile nurseries decorated by real moms just like you that have been shared. You will notice that not all have toile crib bedding sets. Often there is only a small amount of this fabric on display in the room. Perhaps you will see a toile nursery glider, curtains or an accent pillow on the rocking chair; just enough to catch the eye and give the room a touch of elegance.